Yesterday, we talked about a model of Io's atmosphere using the Direct Simulation Monte Carlo (DSMC) method. Today we look at another Monte Carlo (MC) model of Io's atmosphere, this time focusing on simulating the emission of Io's atmosphere during an eclipse. Like the research discussed yesterday, both the abstract for next week's Lunar and Planetary Science Conference (LPSC) and a new paper in press in Icarus are available. The LPSC abstract is titled, "Io's UV-V Eclipse Emission: Implications for Pele-type Plumes," by Chris Moore, David Goldstein, Philip Varghese, and Laurence Trafton. This research will be presented as a talk next Wednesday afternoon, March 3 in the Planetary Atmospheres session. 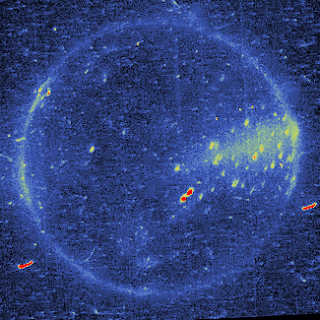 The Icarus paper in press is titled, "Monte Carlo Modeling of Io’s [OI] 6300 Å and [SII] 6716 Å Auroral Emission in Eclipse," by Chris Moore, K. Miki, David Goldstein, K. Stapelfeldt, Philip Varghese, Laurence Trafton, and R.W. Evans. Both cover the topic of simulating Io's auroral emission when the satellites goes into eclipse, but under different regimes: the LPSC abstract discusses emissions in the mid-ultraviolet as the result of SO2 and S2, while the Icarus paper talks about emissions in the red portion of the visible spectrum from oxygen (from decomposed SO2). Last year, this same group published a paper on the dynamics of Io's atmosphere during an eclipse, which occurs each Ionian day when the satellite passes into the shadow of Jupiter. Each eclipse lasts around 2 hours and 20 minutes. During this time, no direct sunlight reaches Io surface, though Europa-shine and refracted sunlight from Jupiter's atmosphere can faintly illuminate the surface. 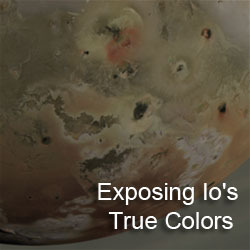 The authors found that Io's atmosphere doesn't completely collapse during an eclipse, as a diffusion layer of non-condensable atmospheric species like oxygen and sulfur monoxide forms near the surface, preventing sulfur dioxide above it from condensing out on to the surface. With their model from last year's paper in hand, the authors further examined it, seeing how their model results would appear at different emission bands of the species they included in their model atmosphere (SO2, O, SO, S, and O2). 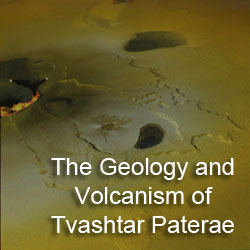 They also examined the emission from S2 gas present in volcanic plumes like Surt and Pele, and the effects of volcanic activity on the other emission bands. In their Icarus paper, Moore et al. focused on two emission bands, the prominent [OI] oxygen emission line at 630 nm and the much fainter [SII] band at 670 nm (both in the red portion of the visible spectrum). Thus in the image above, the emission examined would be colored in red, so that covers much of the limb glow. This limb glow shifts between the north and south polar region of Io, as seen by Galileo and Cassini. Observations by Trauger et al. 1997 also revealed a high altitude bright spot in the [OI] line over the leading hemisphere, which is actually on the wake side of Io since the magnetosphere of Jupiter spins faster than Io revolves around Jupiter. Moore's simulation of Io's atmosphere in eclipse was able to match the observed position of the bright wake spot, but not its intensity. 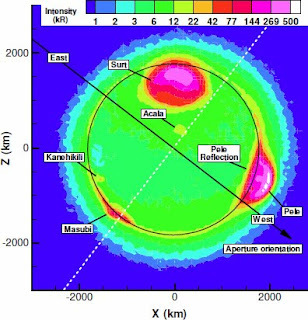 The model suggests that the position of the wake bright spot (which can be seen either above or below the equator) and the polar limb glows are related to the depletion of electrons from the Io-Jupiter flux tube, which effects the 630 nm emission by Io's position above or below the plasma torus, volcanic plumes (particularly large polar plumes), the density of the polar atmosphere, and Io's effect on Jovian magnetic field lines. The authors also found that the [SII] emission is much weaker than the [OI] oxygen line, in part because of the lower S+ (remember, the ratio of oxygen to sulfur in Io's atmosphere is roughly 2 to 1). 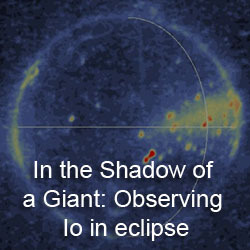 The LPSC abstract examines emission bands by SO2 and S2 in the mid-ultraviolet to the visible (250-600 nm) as Io ingresses into an eclipse. The authors found that the distribution of this emission across Io's sub-jovian hemisphere (the area covered by Trauger et al. 1997 Hubble observations) is strongly effected by volcanic plume activity. These plumes act as shields for the atmosphere south of them from the electrons from the Jupiter-Io flux tube, reducing the energy of these electrons. For example, if both the Surt and Acala plumes are active, the northern Surt plume shows up bright due to S2 emission above 300 nm, while Acala plume south of it appears fainter because molecules in its plume are not as excited by flux tube electrons. The authors also examined the difference between the western and eastern halves of the sub-Jupiter side of Io at these wavelengths. With the Surt and Pele plumes active, the emission from Io was much greater than if they were off. The ratio between the eastern and western halves was greater than one when both are off because of emission from SO2, which as a greater density on the eastern half because before the eclipse, it had been in the afternoon (remember from the article yesterday that Io's sublimation atmosphere peaks in density where the frost temperature is greatest, around 2pm in the afternoon). When both plumes are one, that ratio becomes less than one as the brightness of the S2 emission from the Surt plume dominates the brightness on the western side. With significant differences such as these, the authors suggest that even barely disk-resolved spectra, particularly around 300 nm, can be useful for determining the activity of volcanic plumes on Io from Earth-based data. These two papers explore Io's auroral emission at various wavelengths from the mid-ultraviolet to the visible using a simulation to explain the observations we have on hand. 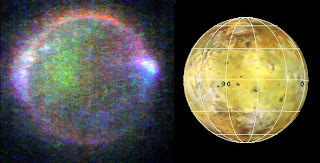 They show that the auroral glow of Io's atmosphere is affected by volcanic plume activity, such that observations from Earth can be used to determine the presence or absence of different plumes, Io's position in the magnetosphere, and the density of Io's atmosphere. These simulations also explore the various chemical species in Io's atmosphere and how even minor constituents like oxygen, formed from the disassociation of sulfur dioxide, can have a strong effect on its auroral, so vividly seen when Io is in eclipse.